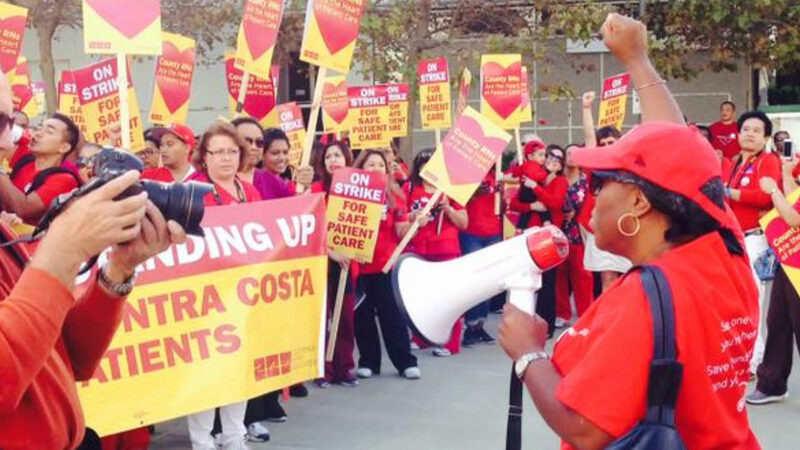 Martinez, Calif. (KGO) -- Nurses who work at Contra Costa Regional Medical Center and clinics across the County began a two-day strike on Tuesday. Nurses say is the County's continued failure to address serious patient care concerns they have been bringing to the County's attention for over a year that is behind this strike. The California Nurses Association/National Nurses United represents almost 1,000 county registered nurses, nurse practitioners and public health nurses. In a written statement they called on the County to immediately, "improve working conditions in order to stop the hemorrhaging of experienced nurses to private hospitals." They say there is a 30 percent wage gap for County RNs compared to the nearby private hospitals, adding that over 100 nurses have left the County in the last year. "We would, of course, rather be at the bedside, providing care," said Liz Isenberg, an RN. "But the loss of experienced nurses has resulted in deteriorating conditions for our patients at the County hospital and clinics. We can't stand by and let that happen. We are walking out for a short time to advocate for improvements that will help our patients in the long run." In a written statement, Contra Costa Health Services Director William Walker said, "The care and safety of our patients is our top priority and we hope to be able to resolve this as quickly as possible." Walker said professional nurses were recruited as replacement workers to ensure essential services are available during the work action. CCRMC and Health Centers provide comprehensive medical services to the residents of this County including services to the County most vulnerable and CCRMC is the only public hospital in this County.